As you may have guessed from some of my other posts, I quite enjoy making my own hiking and camping gear. Making something yourself gives me a bit of a smile. 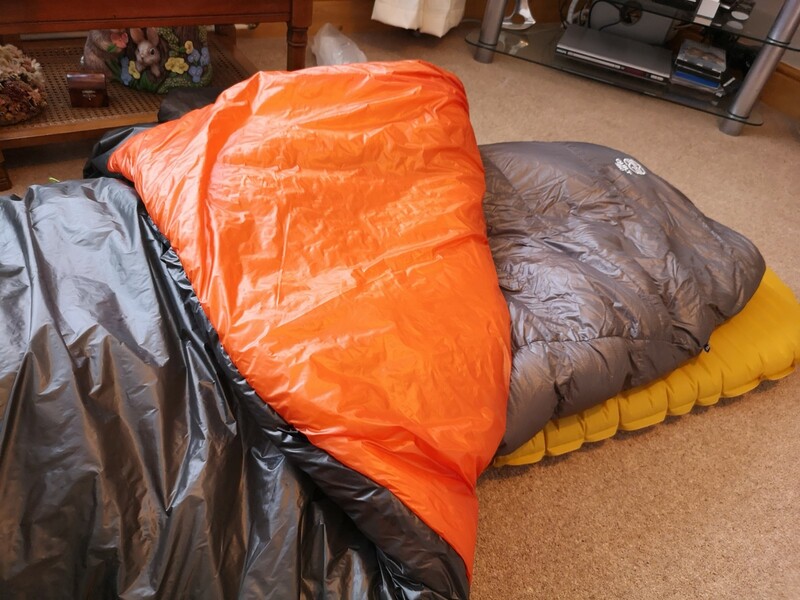 I can customise it to how I want, save money, gain new skills for future MYOG projects and if it fails, I have no one but myself to blame..
For some time, I have used down filled sleeping bags and quilts. The most recent purchase being a Cumulus Quilt 350, something that I will be reviewing later in the year once I have had more nights using it. However, for me down has a few downsides…. Two of my walking friends suffer from Asthma and find using down products near impossible and the most obvious and well know if when down gets wet it looses allot of its thermal properties. Up until recently, I had not used any modern synthetic clothing or insulation other than a Montane Prism jacket which I have had for a few years. Earlier this year I picked up the now discontinued Berghaus Hypertherm Vapourlite jacket and was simply amazed as how such a lightweight jacket kept me so warm. This got me thinking and I started looking into what seemed to be the most widely used synthetic insulation, Climasheild Apex. Sold in various weights and very popular with the MYOG community for not only quilts but clothing, gloves, boots etc I decided to order some up and make my first quilt. Apex as with most synthetic insulations retains most of its thermal properties when wet and does not effect people that suffer from Asthma. Its also made as a continuous sheet meaning there should be no cold spots. The biggest draw backs for Apex in my opinion is packability and weight, although you can pack it small enough its bulkier than down and generally heavier than a similarly rated down product. As a warm sleeper and seeing that summer was closing in on us, I decided to make an Apex 67 quilt first. Its, as far as I am aware, the lightest variant of Apex produced and also the cheapest. I already had some fabric spare for the inner and outer. I ordered the Apex as well as some other bits for the build from AdventureXpert, as Slovenian based company that stock some great fabrics and a good range of Apex weights. The postage was swift and the order arrived well packaged. Ikea bag full of items I already had. Making an Apex quilt is a pretty easy process to be fair. Simply layout the Apex, flatten out any wrinkles and then lay the inner and outer fabrics out over the top. Make sure the fabrics are laid with the outsides facing each other so that when the quilt is turned the right way, any DWR or treated side is facing outwards. Once the fabrics are laid out, carefully ear out your quilt, make sure to double check your measurements before cutting…..
You can probably see from the picture above that I have cut a tapered shape and also added a zip and draw channels in-between the two face fabrics as well as some grosgrain which could be used to close the quilt up if needed. Once your happy everything is in the right place, pin or wonder clip everything together, move to your machine and start stitching around the edge. Ensure you leave around a 8″ gap around the edge so you can turn everything out the right way. I double stitched all the areas where grosgrain, the zip and channels were for added strength. Once turned the right way, you can use binding tape to close up the gap left or a ladder stitch to hide it completely. You should then be left with a completed quilt ready for use. My Apex 67 Quilt came out at 310 Grams which includes shock cord between the cinch attachments, the two draw cords, foot and head end and the shock cord pictured keeping the quilt rolled up. Since making this quilt, I have used it on 13 occasions with temperature ranging from +5C to 17C. As I mentioned above, I sleep warm and was more than comfortable at +5C, I was cooler than normal but at no point did I feel cold. These ratings, I believe are based on the insulation alone. Using various outer and inner fabrics may or may or may not increase the temperature rating of a quilt. After using the Apex 67 quilt over the summer and heading toward the autumn I wanted to make a slightly heavier weight version to use by itself and in addition to my Cumulus quilt during the colder months. My thinking behind this was that each time I have used my Cumulus quilt I have been more than warm enough but I had only seen temperatures of around -4C so far. In order so that I didn’t have to buy a completely separate winter quilt I could use both the down and apex quilts together for additional warmth and the apex quilt would also add a barrier against condensation, using materials with good DWR. I ordered some samples from Adventure Xpert of their 10D fabric with DWR and was very impressed so decided to use the 10D fabric as well as sourcing the insulation from them too. As with my first order, it arrived well packaged and within a few days of placing the order. I constructed the 133 quilt in the same way as the 67 version. Laying the Apex out and then laying the inner and outer fabrics on top. I added a zip to the 67 quilt, I decided not to for this version as I rarely used the zip and wanted it to be as light and simple as possible. The Apex 133 is obviously thicker than 67 but my old Singer machine did a great job. Once fully stitched, I added Kam Snaps for the closure system. I have also made form straps to run under the sleeping pad, connecting to the quilt with the Kam Snaps to keep the quilt tight to the pad and in place if I need to. These straps weight in at 48g. The finished quilt came out at 600g dead and I am very pleased with the finish. The quilt itself is fully reversible, either the grey or the orange can be the outer or the inner. The fabric has a superb DWR and should deal with most situations. In an effort to keep the quilts nice and clean / protected. I wanted too store them in Cuben dry bags. Now anyone who knows anything about cuben knows it isn’t cheap. Thankfully Extrem Textiles has some remnant 1oz black cuben on sale which I snapped up. It didn’t take long to work out I didn’t have enough for both quilts, but it didn’t take long to make one dry bag for the Apex 67 quilt and another for cloths or other odd bits. If you want any information about making your own quilt, drop me a comment of a message, happy to help. If making your own quilt is not for you, there are plenty of places you can buy Apex quilts. One make I would recommend would be As Tucas. I have seen a few of their products and they are all very well made. Thanks Robin, I looked at the Gramxpert gear recently. They look very good! good one. am looking at making one myself just not sure on which insulation i will need?